Residents of Anyaa School Junction in the Ga Central Municipality near Awoshie, a suburb of Accra, have raised red flags over the influx of filling stations in the area. This, according to residents, could lead to another disaster if authorities do not take steps to stop the operations of these filling stations. They have therefore issued an SOS to the Environmental Protection Agency (EPA), Ghana Standards Authority (GSA), Ghana National Fire Service (GNFS), the National Petroleum Authority (NPA) as well as the Ministry of Environment, Science, Technology and Innovations and all bodies associated with issuing permits for the construction of commercial gas and fuel filling stations to ensure that they are not sited in residential areas, to come to their aid. This follows the decision to site a gas/filling station in the locality, which poses a danger to residents. A visit to the site recently confirmed that two fuel filling stations- Excel Oil Company Limited and Strategic Energy Limited (SEL) – were situated in the middle of the residential area, with Glee Oil, another filling station, under construction on the same stretch. The Environment, Science, Technology and Innovations Minister, Mahama Ayariga, recently ordered that all gas and filling stations in all residential areas be closed down following a gas station explosion at Dansoman in Accra. However, this directive has not been adhered to by the EPA as it continues to grant licenses to petrol stations in residential areas. The residents claimed that though the EPA had initially come round to prevent Excel Oil Company Limited from operating, they had allegedly falsified some documents that suggested that they (the residents) had given them permission to operate despite the risk the business poses to their lives. They added that the EPA placed a 'stop work' notice at the construction site on September 16, 2015 but the warning was treated with contempt as work continued. According to residents, Excel Oil Company Limited had been constructed directly on a waterway, which was likely to cause flooding in that area in the rainy season. “The EPA shouldn't have given them permit and the GCMA shouldn't have also given them the building permit. They should have acquired a bigger plot somewhere that was not close to our residence. In case of any fire incident like what happened on June 3 last year, it will cause a lot of damage and even claim lives. We want the EPA and the other authorities to come out and tell us how those filling stations got their permits to operate because we feel where the filling stations are situated is unsafe,” a resident told the paper. The tour of the area also revealed that the Excel Oil Company Limited was situated closely to a kenkey cooking house and two welding shops, even though these businesses depend heavily on naked flame for their operations. NPA's regulation indicates that gas or fuel filling stations should be situated about 30.8 meters or 100 feet away from residential areas, but that was not the situation on the ground as the filling stations were less than 10 meters away from residences. Another resident who appeared worried about the situation wondered how the EPA, GSA and NPA allowed the construction of filling stations in the midst of welding shops, houses, churches, shops, drinking spots, and banks among others. She said their fear stemmed from the fact that most of the businesses operating around the filling stations used fire for their trades. “How did these filling stations, especially Excel Oil Company Limited, secure permits to operate in a residential area and on a waterway close to a kenkey house and also surrounded by two welders? The authorities haven't learnt from what happened from the June 3 disaster that hit the country,” she added. 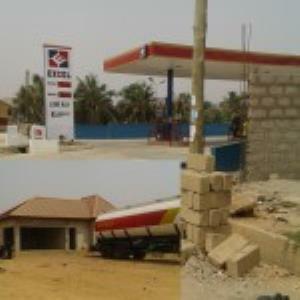 The issue of fuel and gas filling stations springing up in residential areas is currently an issue disturbing discerning Ghanaians. Some have said owners of these filling stations are top guns in the ruling National Democratic Congress (NDC). One of the pump attendants, who spoke on condition of anonymity because the manager had instructed them not to grant interviews or give out his number to any media house, said the filling station had secured all the necessary documentation and also had the backing of the residents to commence operations. Glee Oil was also in the process of constructing a new fuel filling station just before the Excel Oil Company Limited. However, various attempts to get the EPA to comment on the issue proved futile as appointments were ignored.